Low Oil Prices: Why Worry? Most people believe that low oil prices are good for the United States, since the discretionary income of consumers will rise. There is the added benefit that Peak Oil must be far off in the distance, since “Peak Oilers” talked about high oil prices. Thus, low oil prices are viewed as an all around benefit. In fact, nothing could be further from the truth. The Peak Oil story we have been told is wrong. The collapse in oil production comes from oil prices that are too low, not too high. If oil prices or prices of other commodities are too low, production will slow and eventually stop. Growth in the world economy will slow, lowering inflation rates as well as economic growth rates. We encountered this kind of the problem in the 1930s. We seem to be headed in the same direction today. Figure 1, used by Janet Yellen in her September 24 speech, shows a slowing inflation rate for Personal Consumption Expenditures (PCE), thanks to lower energy prices, lower relative import prices, and general “slack” in the economy. Figure 1. 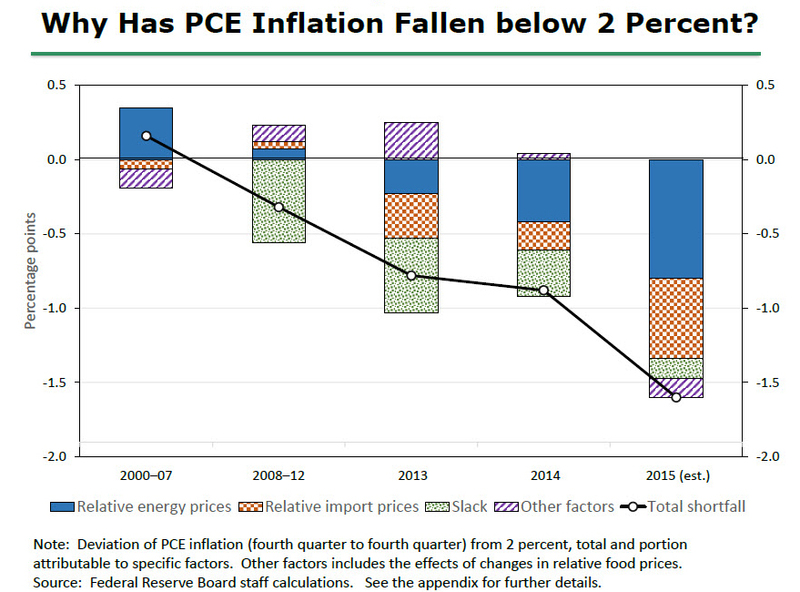 “Why has PCE Inflation fallen below 2%?” from Janet Yellen speech, September 24, 2015. What Janet Yellen is seeing in Figure 1, even though she does not recognize it, is evidence of a slowing world economy. The economy can no longer support energy prices as high as they have been, and they have gradually retreated. Currency relativities have also readjusted, leading to lower prices of imported goods for the United States. Both lower energy prices and lower prices of imported goods contribute to lower inflation rates. Instead of reaching “Peak Oil” through the limit of high oil prices, we are reaching the opposite limit, sometimes called “Limits to Growth.” Limits to Growth describes the situation when an economy stops growing because the economy cannot handle high energy prices. In many ways, Limits to Growth with low oil prices is worse than Peak Oil with high oil prices. Slowing economic growth leads to commodity prices that can never rebound by very much, or for very long. Thus, this economic malaise leads to a fairly fast cutback in commodity production. It can also lead to massive debt defaults. Let’s look at some of the pieces of our current predicament. Part 1. Getting oil prices to rise again to a high level, and stay there, is likely to be difficult. High oil prices tend to lead to economic contraction. Figure 2. Chart made by author in Feb. 2010, for an article called Peak Oil: Looking for the Wrong Symptoms. 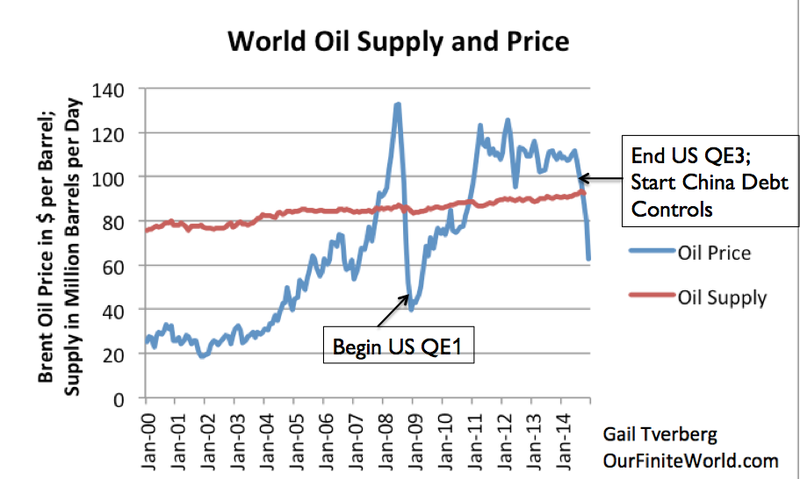 Clearly Figure 2 exaggerates some aspects of an oil price change, but it makes an important point. If oil prices rise–even if it is after prices have fallen from a higher level–there is likely to be an adverse impact on our pocketbooks. Our wages (represented by the size of the circles) don’t increase. Fixed expenses, including mortgages and other debt payments, don’t change either. 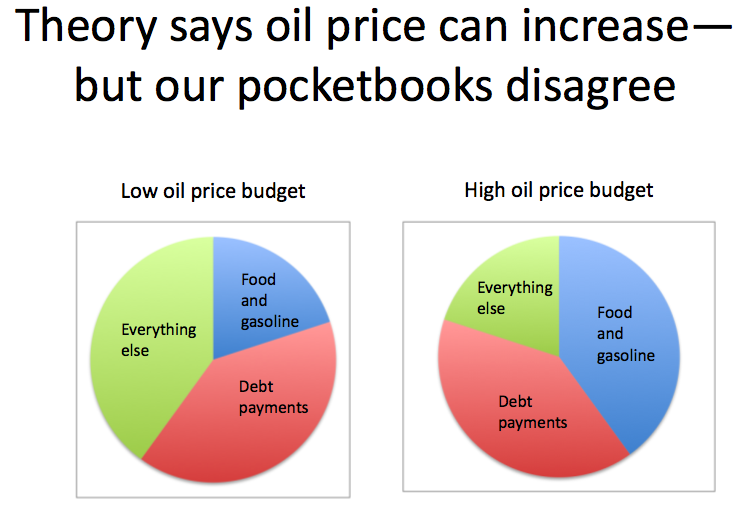 The expenses that do increase in price are oil products, such as gasoline and diesel, and food, since oil is used to create and transport food. When the cost of food and gasoline rises, discretionary spending (in other words, “everything else”) shrinks. When discretionary spending gets squeezed, layoffs are likely. Waitresses at restaurants may get laid off; workers in the home building and auto manufacturing industries may find their jobs eliminated. Some workers who get laid off from their jobs may default on their loans causing problems for banks as well. We start the cycle of recession and falling oil prices that we should be familiar with, after the crash in oil prices in 2008. So instead of getting oil prices to rise permanently, at most we get a zigzag effect. Oil prices rise for a while, become hard to maintain, and then fall back again, as recessionary influences tend to reduce the demand for oil and bring the price of oil back down again. Part 2. The world economy has been held together by increasing debt at ever-lower interest rates for many years. We are reaching limits on this process. Back in the second half of 2008, oil prices dropped sharply. A number of steps were taken to get the world economy working better again. The US began Quantitative Easing (QE) in late 2008. This helped reduce longer-term interest rates, allowing consumers to better afford homes and cars. Since building cars and homes requires oil (and cars require oil to operate as well), their greater sales could stimulate the economy, and thus help raise demand for oil and other commodities. Figure 3. World Oil Supply (production including biofuels, natural gas liquids) and Brent monthly average spot prices, based on EIA data. Following the 2008 crash, there were other stimulus efforts as well. China, in particular, ramped up its debt after 2008, as did many governments around the world. This additional governmental debt led to increased spending on roads and homes. This spending thus added to the demand for oil and helped bring the price of oil back up. These stimulus effects gradually brought prices up to the $120 per barrel level in 2011. After this, stimulus efforts gradually tapered. Oil prices gradually slid down between 2011 and 2014, as the push for ever-higher debt levels faded. When the US discontinued its QE and China started scaling back on the amount of debt it added in 2014, oil prices began a severe drop, not too different from the way they dropped in 2008. I reported earlier that the July 2008 crash corresponded with a reduction in debt levels. 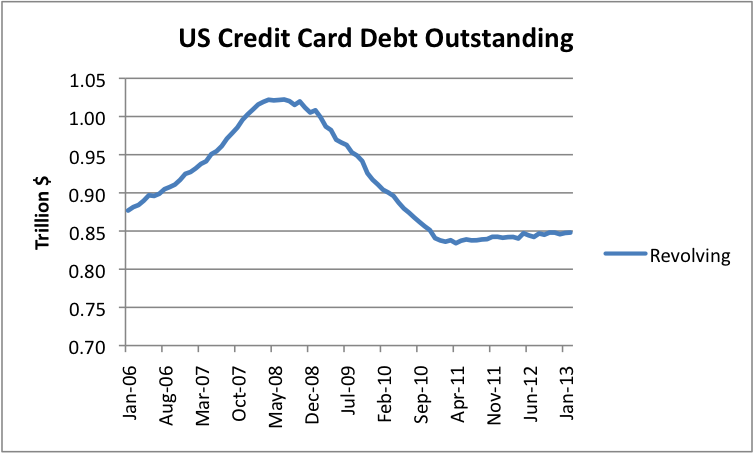 Both US credit card debt (Fig. 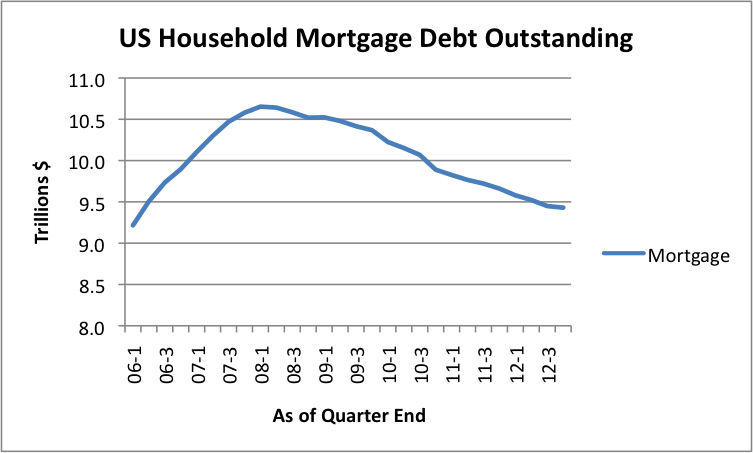 4) and mortgage debt (Fig. 5) decreased at precisely the time of the 2008 price crash. Figure 4. US Revolving Debt Outstanding (mostly credit card debt) based on monthly data from the Federal Reserve. Figure 5. US Mortgage Debt Outstanding, based on the Federal Reserve Z1 Report. At this point, interest rates are at record low levels; they are even negative in some parts of Europe. 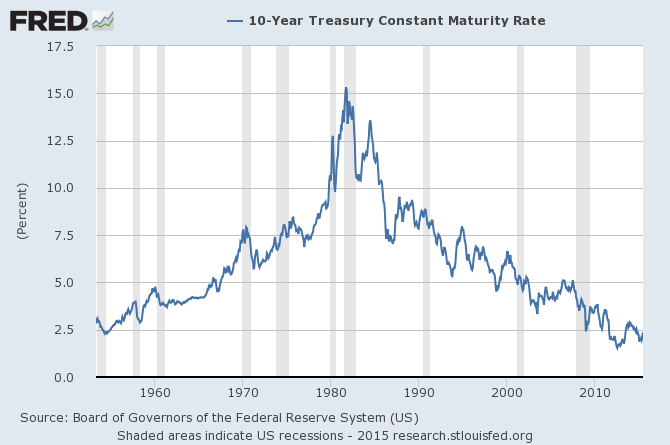 Interest rates have been falling since 1981. Figure 6. Chart prepared by the St. Louis Fed using data through July 20, 2015. I showed in a recent post (How our energy problem leads to a debt collapse problem) that when the cost of oil production is over $20 per barrel, we need ever-higher debt ratios to GDP to produce economic growth. This need for ever-rising debt contributes to our inability to keep commodity prices high enough to satisfy the needs of commodity producers. Part 3. 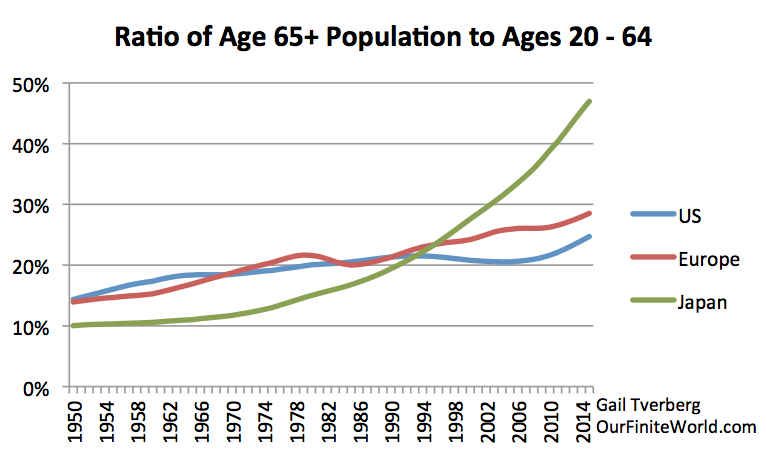 We are reaching a demographic bottleneck with the “baby boomers” retiring. This demographic bottleneck causes an adverse impact on the demand for commodities. Demand represents the amount of goods customers can afford. The amount consumers can afford doesn’t necessarily rise endlessly. One of the problems leading to falling demand is falling inflation-adjusted median wages. I have written about this issue previously in How Economic Growth Fails. Figure 7. 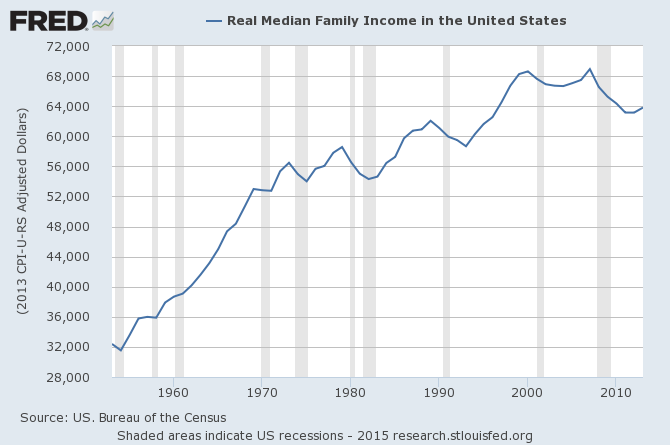 Median Inflation-Adjusted Family Income, in chart prepared by the Federal Reserve of St. Louis. Another part of the problem of falling demand is a falling number of working-age individuals–something I approximate by using estimates of the population aged 20 to 64. 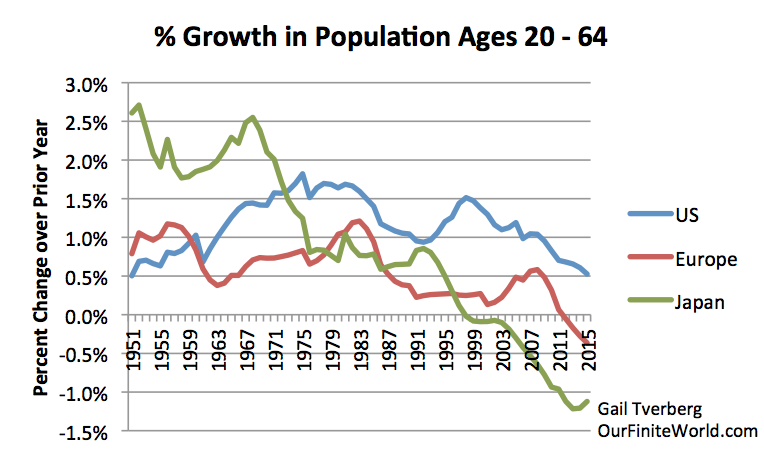 Figure 8 shows how the population of these working-age individuals has been changing for the United States, Europe, and Japan. Figure 8. Annual percentage growth in population aged 20 – 64, based on UN 2015 population estimates. Figure 8 indicates that Japan’s working age population started shrinking in 1998 and now is shrinking by more than 1.0% per year. Europe’s working age population started shrinking in 2012. The United States’ working age population hasn’t started shrinking, but its rate of growth started slowing in 1999. This slowdown in growth rate is likely part of the reason that labor force participation rates have been falling in the United States since about 1999. Figure 9. 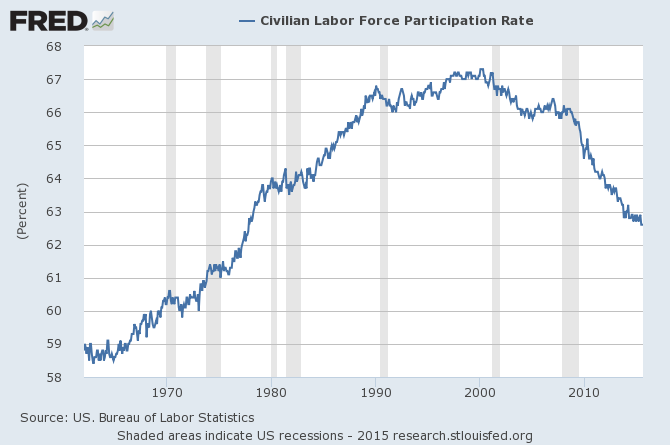 US Labor force participation rate. Chart prepared by the Federal Reserve of St. Louis. When there are fewer workers, the economy has a tendency to shrink. Tax levels to pay for retirees are likely to start increasing. As the ratio of retirees rises, those still working find it increasingly difficult to afford new homes and cars. In fact, if the population of workers aged 20 to 64 is shrinking, there is little need to add new homes for this group; all that is needed is repairs for existing homes. Many retirees aged 65 and over would like their own homes, but providing separate living quarters for this population becomes increasingly unaffordable, as the elderly population becomes greater and greater, relative to the working age population. Figure 10 shows that the population aged 65 and over already equals 47% of Japan’s working age population. (This fact no doubt explains some of Japan’s recent financial difficulties.) The ratios of the elderly to the working age population are lower for Europe and the United States, but are trending higher. This may be a reason why Germany has been open to adding new immigrants to its population. Figure 10. Ratio of elderly (age 65+) to working age population (aged 20 to 64) based on UN 2015 population estimates. For the Most Developed Regions in total (which includes US, Europe, and Japan), the UN projects that those aged 65 and over will equal 50% of those aged 20 to 64 by 2050. China is expected to have a similar percentage of elderly, relative to working age (51%), by 2050. With such a large elderly population, every two people aged 20 to 64 (not all of whom may be working) need to be supporting one person over 65, in addition to the children whom they are supporting. Demand for commodities comes from workers having income to purchase goods that are made using commodities–things like roads, new houses, new schools, and new factories. Economies that are trying to care for an increasingly large percentage of elderly citizens don’t need a lot of new houses, roads and factories. This lower demand is part of what tends to hold commodity prices down, including oil prices. Part 4. World oil demand, and in fact, energy demand in general, is now slowing. If we calculate energy demand based on changes in world consumption, we see a definite pattern of slowing growth (Fig.11). I commented on this slowing growth in my recent post, BP Data Suggests We Are Reaching Peak Energy Demand. Figure 11. 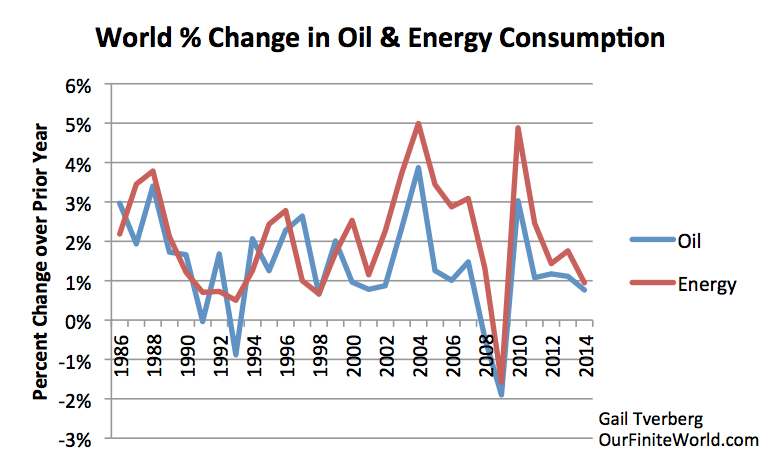 Annual percent change in world oil and energy consumption, based on BP Statistical Review of World Energy 2015 data. The pattern we are seeing is the one to be expected if the world is entering another recession. Economists may miss this point if they are focused primarily on the GDP indications of the United States. World economic growth rates are not easily measured. China’s economic growth seems to be slowing now, but this change does not seem to be fully reflected in its recently reported GDP. Rapidly changing financial exchange rates also make the true world economic growth rate harder to discern. Countries whose currencies have dropped relative to the dollar are now less able to buy our goods and services, and are less able to repay dollar denominated debts. Part 5. The low price problem is now affecting many commodities besides oil. The widespread nature of the problem suggests that the issue is a demand (affordability) problem–something that is hard to fix. Figure 12. 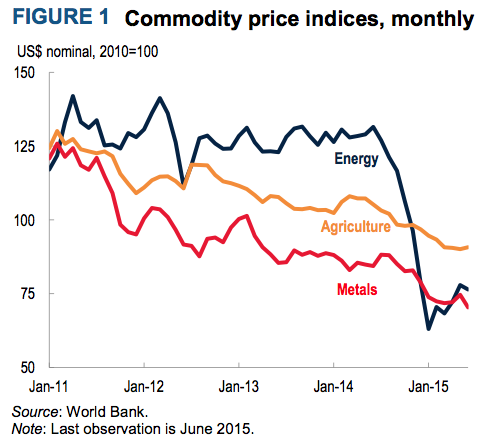 Monthly commodity price index from Commodity Markets Outlook, July 2015. Used under Creative Commons license. Energy prices stayed high longer than other prices, perhaps because they were in some sense more essential. But now, they have fallen as much as other prices. The fact that commodities tend to move together tends to hold over the longer term, suggesting that demand (driven by growth in debt, working age population, and other factors) underlies many commodity price trends simultaneously. Figure 13. 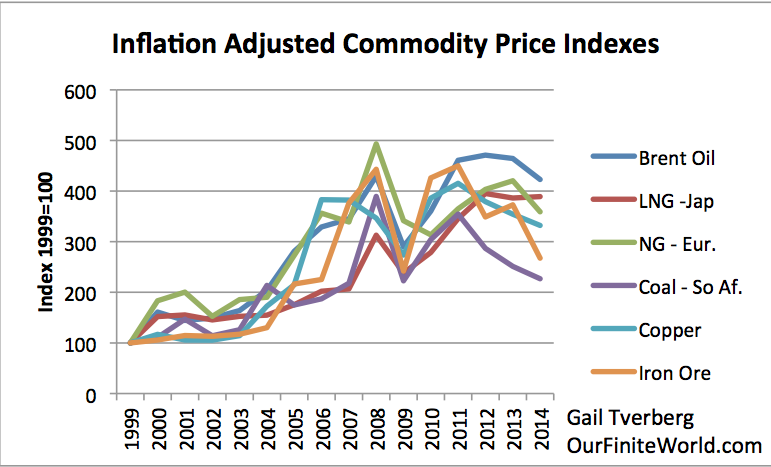 Inflation adjusted prices adjusted to 1999 price = 100, based on World Bank “Pink Sheet” data. The world economy cannot tolerate high priced energy because of the problem shown in Figure 2. We have increasingly used cheaper debt and larger quantities of debt to cover this basic problem, but are running out of fixes. The cost of producing energy products keeps trending upward, because we extracted the cheap-to-produce oil (and coal and natural gas) first. We have no alternative but to use more expensive-to-produce energy products. Many costs other than energy costs have been trending upward in inflation-adjusted terms, as well. These include fresh water costs, the cost of metal extraction, the cost of mitigating pollution, and the cost of advanced education. All of these tend to squeeze discretionary income in a pattern similar to the problem indicated in Figure 2. Thus, they tend to add to recessionary influences. We are now reaching a working population bottleneck as well, as described in Part 4. Part 6. Oil prices seem to need to be under $60 barrel, and perhaps under $40 barrel, to encourage demand growth in US, Europe, and Japan. If we look at the historical impact of oil prices on consumption for the US, Europe, and Japan combined, we find that whenever oil prices are above $60 per barrel in inflation-adjusted prices, consumption tends to fall. Consumption tends to be flat in the $40 to $60 per barrel range. It is only when prices are in the under $40 per barrel range that consumption has generally risen. Figure 14. 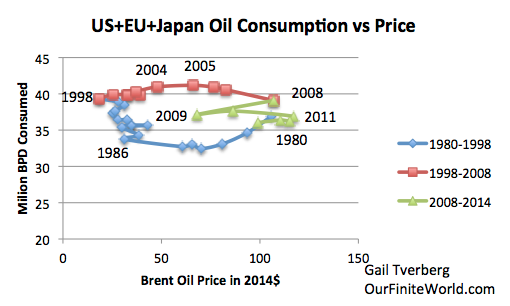 Historical consumption vs. price for the United States, Japan, and Europe. Based on a combination of EIA and BP data. The amount that consumers in advanced economies can afford. The amount the producers, with their current high-cost structure, actually need. One issue, with lower oil prices, is, “What kinds of uses do the lower oil prices encourage?” Clearly, no one will build a new factory using oil, unless the price of oil is expected to be sufficiently low over the long-term for this use. Thus, adding industry will likely be difficult, even if the price of oil drops for a few years. We also note that the United States seems to have started losing its industrial production in the 1970s (Fig. 15), as its own oil production fell. Apart from the temporarily greater use of oil in shale drilling, the trend toward off-shoring industrial production will likely continue, regardless of the price of oil. Figure 15. 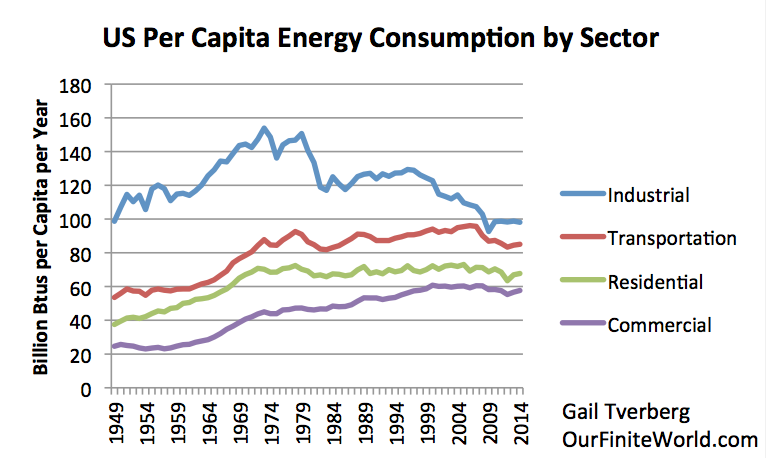 US per capita energy consumption by sector, based on EIA data. Includes all types of energy, including the amount of fossil fuels that would need to be burned to produce electricity. If we cannot expect low oil prices to favorably affect the industrial sector, the primary impact of lower oil prices will likely be on the transportation sector. (Little oil is used in the residential and commercial sectors.) Goods shipped by truck will be cheaper to ship. This will make imported goods, which are already cheap (thanks to the rising dollar), cheaper yet. Airlines may be able to add more flights, and this may add some jobs. But more than anything else, lower oil prices will encourage people to drive more miles in personal automobiles and will encourage the use of larger, less fuel-efficient vehicles. These uses are much less beneficial to the economy than adding high-paid industrial jobs. Part 7. Saudi Arabia is not in a position to help the world with its low price oil problem, even if it wanted to. 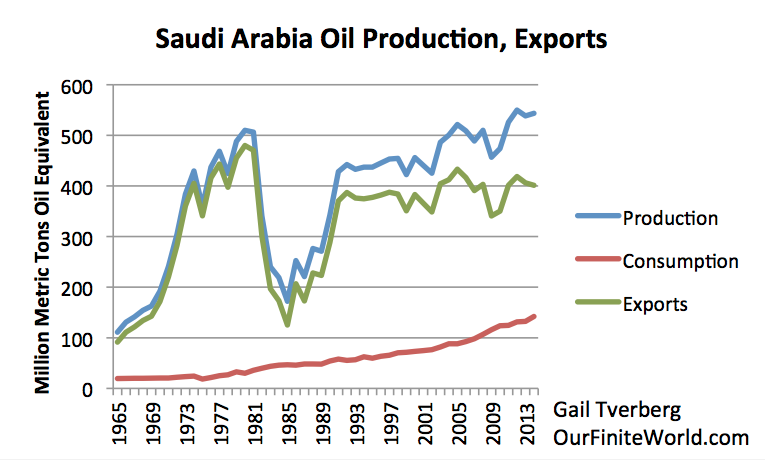 Many of the common beliefs about Saudi Arabia’s oil capacity are of doubtful validity. Saudi Arabia claims to have huge oil reserves, but as a practical matter, its growth in oil production has been modest. Its oil exports are actually down relative to its exports in the 1970s, and relative to the 2005-2006 period. Figure 16. Saudi Arabia’s oil production, consumption, and exports based on BP Statistical Review of World Energy 2015 data. Low oil prices are having an adverse impact on the revenues that Saudi Arabia receives for exporting oil. In 2015, Saudi Arabia has so far issued bonds worth $5 billion US$, and plans to issue more to fill the gap in its budget caused by falling oil prices. Saudi Arabia really needs $100+ per barrel oil prices to fund its budget. In fact, nearly all of the other OPEC countries also need $100+ prices to fund their budgets. Saudi Arabia also has a growing population, so it needs rising oil exports just to maintain its 2014 level of exports per capita. Saudi Arabia cannot reduce its exports by 10% to 25% to help the rest of the world. It would lose market share and likely not get it back. Losing market share would permanently leave a “hole” in its budget that could never be refilled. Saudi Arabia and a number of the other OPEC countries have published “proven reserve” numbers that are widely believed to be inflated. Even if the reserves represent a reasonable outlook for very long term production, there is no way that Saudi oil production can be ramped up greatly, without a large investment of capital–something that is likely not to be available in a low price environment. In the United States, there is an expectation that when estimates are published, the authors will do their best to produce correct amounts. In the real world, there is a lot of exaggeration that takes place. Most of us have heard about the recent Volkswagen emissions scandal and the uncertainty regarding China’s GDP growth rates. Saudi Arabia, on a monthly basis, does not give truthful oil production numbers to OPEC–OPEC regularly publishes “third party estimates” which are considered more reliable. If Saudi Arabia cannot be trusted to give accurate monthly oil production amounts, why should we believe any other unaudited amounts that it provides? Part 8. We seem to be at a point where major debt defaults will soon start for oil and other commodities. Once this happens, the resulting layoffs and bank problems will put even more downward pressure on commodity prices. Wolf Richter has recently written about huge jumps in interest rates that are being forced on some borrowers. Olin Corp., a manufacture of chlor-alkali products, recently attempted to sell $1.5 billion in eight and ten year bonds with yields of 6.5% and 6.75% respectively. Instead, it ended up selling $1.22 billion of bonds with the same maturities, with yields of 9.75% and 10.0% respectively. Richter also mentions existing bonds of energy companies that are trading at big discounts, indicating that buyers have substantial questions regarding whether the bonds will pay off as expected. Chesapeake Energy, the second largest natural gas driller in the US, has 7% notes due in 2023 that are now trading at 67 cent on the dollar. Halcon Resources has 8.875% notes due in 2021 that are trading at 33.5 cents on the dollar. Lynn Energy has 6.5% notes due in 2021 that are trading at 23 cents on the dollar. Clearly, bond investors think that debt defaults are not far away. The latest round of twice-yearly reevaluations is under way, and almost 80 percent of oil and natural gas producers will see a reduction in the maximum amount they can borrow, according to a survey by Haynes and Boone LLP, a law firm with offices in Houston, New York and other cities. Companies’ credit lines will be cut by an average of 39 percent, the survey showed. Debts of mining companies are also being affected with today’s low prices of metals. Thus, we can expect defaults and cutbacks in areas other than oil and gas, too. There is a widespread belief that if prices remain low, someone will come along, buy the distressed assets at low prices, and ramp up production as soon as prices rise again. If prices never rise for very long, though, this won’t happen. The bankruptcies that occur will mean the end for that particular resource play. We won’t really be able to get prices back up to where they need to be to extract the resources. Thus low prices, with no way to get them back up, and no hope of making a profit on extraction, are likely the way we reach limits in a finite world. Because low demand affects all commodities simultaneously, “Limits to Growth” equates to what might be called “Peak Resources” of all kinds, at approximately the same time. This entry was posted in Financial Implications and tagged debt defaults, demographics, limits to growth, low oil prices, oil demand, peak oil, recession. Bookmark the permalink. 1,093 Responses to Low Oil Prices: Why Worry? A disgruntled Chinese investor has stabbed the chief executive of an asset management company, the latest sign of escalating tension in the country’s financial system amid rising defaults. Wang Jie, chief executive officer of Global Wealth Investment (Beijing), was rushed to hospital after an investor stabbed him during a meeting on Sunday, opening a wound of about 15cm in his shoulder, according to Caixin, a respected financial news website. The alleged assailant had invested Rmb300,000 ($47,300) in a wealth management product that failed to pay out as promised. Why, given its fabrications, inconsistencies, and moral myopia, do we continue to cherish “Walden”? For you to throw mud at him and others of the same outlook is unjust and outright unjust and disrespectful from one that claims to speak the “truth”. You harp about the end of BAU all the time…friend if you have the courage to read of his life hardships and challenges he and his associates endured’ you will get the Monty of before BAU. When you, yourself, actually get a taste of a bit of it yourself, … I know you been there, done that. I hate to get pulled into this argument but I recall reading he took at least some of his meals at the local inn and took his laundry home to Mom for washing. No reference and no desire to continue the debate. I enjoyed reading Raymond Mungo’s rip off of A Week on the Concord and Merrimack Rivers. I followed TheOilDrum from around 2005 up til it was finally closed and I also started to read your blog many years ago, back when the oil price seemed to be on a rentless ever lasting upward trend. You had good arguments as to why this was the case and it all made sense to me. I am not easily impressed, but I thought that you got most things right back then. Then came a shift in the trend with falling oil prices, and I continued to follow your blog, even as I noted that you altered your theories about how things work, but here I think that you made a huge misstake. I for one think that the original model for how oil is consumed and how oil wells are depleted over time is still valid, that this will soon lead to a overall peak in world oil production and that this in turn will indeed lead to much higher oil prices in a not too distant future. For a few years now the world has been able to enjoy the fruits from the last-ditch effort to extract what is called “tight oil”, but even if this has now lead to a very temporary oversupply that maybe makes it look like the oil price will be on a permanent downward trend from here on, that will not be the case, and soon enough the upward trend will indeed resume. Only this time the “tight oil” card has already been played and that source of abundance will hence be gone at the same time as also the worlds conventional oil resource continues to deplete at a steady pace. The most respectable names in the “peak-oil” community wrote about shale oil and other unconventional types of oil already back in 2005-2006, when I started to follow TheOilDrum on a daily basis, and the discussion about what impact that these technologies would have on the over-all long term picture was very interesting to follow. The general consensus seemed to be that in a base case scenario this would buy the world a few more years before the real problems would start to set in. And this is just what I think it did. Only the world hardly even took notice of this fact but instead contiuned on as if everything was back to normal and now that period of happy havest is rapidly drawing to an end and while a few might think that this is valid prof that the peak-oil community was all dead wrong, I can only say that even if they appear to have been a little bit too pessimistic about the time frame in which the real problems would start to develop, the overall long term picture that they painted, at least in my view, remains very intact and correct. Of course, the future will bring the final judgement as to who is right and who is wrong, but I can see no evidence that the long term effects of dimishing ROIE and falling oil production due to the passing of peak oil can lead to anything else than higher energy prices relative to everything else. People will still need energy to survive and be prepared to give up almost everything else in order to still get their share. The world economy will shink, of course, and that will make the oil price volatile, but if the price falls to much, so will production,which in turn reduces supply and leads the price to rise again, and so on. But the overall trend will be upward, due to the fact that long term supply will be lower for each year that lies after the peak in total oil production, and unconventional oil production will at best provide a few years of relif for the pain that will follow and most of those years now lie behind us, as opposed to the situation in 2005, when most of these technologies were still in the early test stage at best. Barring a sudden unforseen collapse of this civilisation, it is my prediction that the world economy will continue on a long term downward trend from here on until the system finally reaches a critical breaking point, after which the final collapse stage will begin. Nothing that bankers, governments or anyone else will do can change this fact in any measurable way. What the world leaders can do instead is to try to adjust to this new situation, forget about growth once and for all and instead try to find ways to ease the pain and suffering that will follow. Or maybe they’ll just start a new world war and let it all go up in flames – who knows? I think oil will remain high in real terms, whatever the nominal price put on it. If you are broke, even $1 gasoline is expensive, but if you are swimming in money, $4 gas isn’t. To be sure, governments will step in to guarantee a certain minimum production which means a floor to the price. Everything on this planet that humans are willing to pay for has both a lower and upper bound in price. Everything. Shipping is a measure of the real economy. And it isn’t doing very well, apparently. September is in the early phase of the make-or-break holiday shipping season. Shipments usually increase from August to September. They did this year too. The number of shipments in September inched up 1.7% from August, according to the Cass Freight Index. But the index was down 1.5% from an already lousy September last year, when shipments had fallen from the prior month, instead of rising. And so, in terms of the number of shipments, it was the worst September since 2010. It has been crummy all year: With the exception of January and February, the shipping volume has been lower year-over-year every month! The index is broad. It tracks data from shippers, no matter what carrier they choose, whether truck, rail, or air, and includes carriers like FedEx and UPS. Evidence keeps piling up in the most unpleasant manner that something isn’t quite right in the real economy. The world is now in an inexplicable slowdown – “inexplicable” for central bankers who’ve cut interest rates to zero or below zero years ago, and who’re still dousing some economies with QE even as governments are running up big deficits. And yet, despite seven years of this huge monetary and fiscal stimulus, the global economy is deteriorating. In this scenario, the US has been the “cleanest dirty shirt,” as it is now referred to, after the term “locomotive” fell for obvious reasons into disuse. But the freight data throws more sticky dirt on that shirt. For a historical perspective of just how crummy things have become, and how we’re made to think that they’re actually pretty good, after all the Fed’s gyrations: the number of shipments in September was down 13% from the levels in September 2004 and 2006. Think about what goes on behind the scenes, don’t be so naive. Think about what goes on in your house, at your work. Do you let the secrets out to everybody? It’s the same thing with banks and governments. Nothing is inexplicable to these guys. They know full well that they are bailing out the banks and the real economy can go to pot. At the last resort, just stop reporting any real numbers and fabricate information and give it to the corporate media to spoon feed out. That’s the point. We actually need a massive decline in the real economy because it wastes too much! The world is now filled to the brim with useless infrastructure and useless eaters and those in charge know that, so they are preparing us to be culled. But you can’t let it on. You have to keep the propaganda full steam, that’s the key. Never let the general mass of people have a clue what’s happening. If they did, nobody would even show up to work. And they would stop consuming the foodstuffs and entertainments and sports and that’s a no no. You have to keep a minimum amount of healthy bodies working to transition to a post industrial scrap/service economy. It is critical that these workers believe in the system. Heck you can even bring the unions back to the bargaining table, within reason. But they absolutely must believe that their work is important and that everything is fine and humanity is reaching for the stars. You can never really tell people that they are peons who consume fossil fuels who will one day become decomposing organic matter themselves, you will just make them depressed and no amount of Prozac will get them to punch their alarm clock. This is all an orchestrated plan …. to reduce consumption and wasteful eaters…. to step down the economy to something more sustainable…. powered by renewable energy …. populated by people in Brooks Brothers casual clothing…. It’s all part of the grand plan…. The thing is… I have quite a lot of food in storage … do you think chickens will eat uncooked rice? The labor market, long the country’s lone economic bright spot as growth stagnated, is suddenly deteriorating rapidly, driving unemployment all the way up to 7.6 percent from a record-low 4.3 percent at the end of 2014. 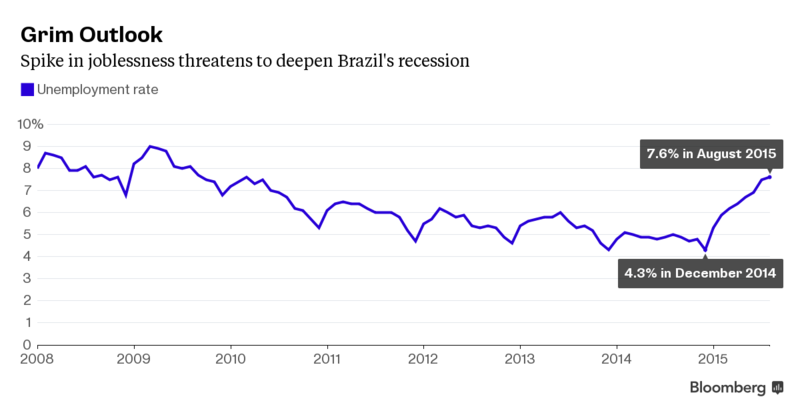 Sao Paulo is now losing about 20,000 jobs each and every month, the state’s industrial federation estimates. This all has to be related to its difficulties with subsalt (pre salt) oil production. Also its drought. There was a big scandal, but that was enabled by the oil company’s problems. FE check with someone who knows about the uncooked rice. People stopped throwing rice at weddings because the birds eat it, it hydrates and ruptures the intestines. FE is think dolph9 is just saying enjoy it while it last.